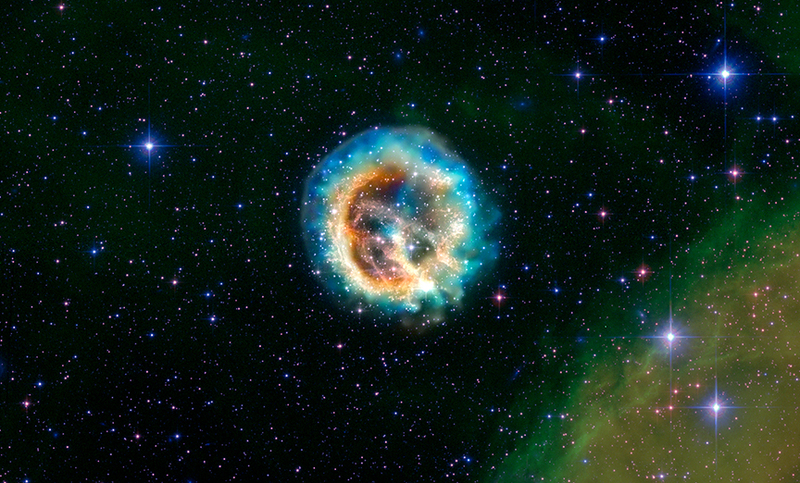 Shortly after the Chandra X-ray Observatory opened its eye for the first time in 1999, the orbiting probe snapped its first picture of a supernova remnant about 190,000 light-years away that’s lovingly called 1E 0102.2-7219—or E0102 for short. In the immortal word of Keanu Reeves: Whoa. The brilliant new picture (click here for a larger version) combines Chandra’s x-ray data with a visible-light image from its orbiting partner the Hubble Space Telescope. Together the two orbiters show the supernova’s hot outer blast wave as a blue halo around the cooler inner material, with bright stars glittering in the background. The green blob in the lower right is a cloud of gas and dust being illuminated by one very massive star (not pictured), probably not unlike the one that went boom and created E0102. While the x-ray data add some great visual details to the shot, Chandra also contributed to the scientific analysis of the remnant. The x-rays, for instance, have helped astronomers get a better picture of the geometry of the explosion. That’s because x-rays with different levels of energy shine differently for Chandra. Since energy levels are linked to direction, scientists can tell how the object’s components are moving relative to each other. —X-ray: NASA/CXC/SAO, Infrared: NASA/JPL-Caltech; Optical: MPIA, Calar Alto, O.Krause et al. —Image courtesy NASA/CXC/NCSU/S.Reynolds et al. —Image courtesy NASA/CXC/MIT/UMass Amherst/M.D.Stage et al.